A Division Bench of Kerala High Court comprising of Justice P.R.Ramachandra Menon and Justice Anil.K Narendran in P.J. Jose & Ors. v. Vanchankal Niyas & Ors [M.A.C.A.No. 2482 of 2009] has held that an accident arising out of non wearing of helmet does not lead to an inference to the case of contributory negligence on the part of the person causing accident, so as to limit his claims arising out of such accident. The deceased, who was a student in Coimbatore met with an accident on 11/05/2007, while travelling in his motor cycle. The accident occurred due to the collision of the motor cycle driven by the deceased with a jeep owned, driven, and insured by respondents 1 to 3 respectively. The deceased died due to the fatal injuries arising out of the accident on the same date. In the claim filed before the tribunal by his legal heirs, his claim was limited by the tribunal due to the fact that he had not put on a helmet at the time of accident and this would result in contributory negligence on the part of the deceased. Aggrieved by the order of the tribunal in limiting the claim, the legal heirs of the deceased had approached the High Court seeking enhancement. Perusing the order of the tribunal, the High court held that approach of the tribunal in limiting the award of claim, holding that act of deceased in not wearing a helmet at the time of accident amounted to contributory negligence was wrong and erroneous interpretation of law in this regard. The court observed as follows:- “We find it difficult to agree with the proposition that non wearing of 'Helmet', though an offence under the relevant provisions of the M.V.Act, could be taken as a ground to fix contributory negligence on the part of the rider. What is to be considered with regard to the apportionment of negligence is whether the party concerned had any role/part in causing or contributing to the accident. In other words, the consequence pursuant to the accident is not a circumstance to be weighed for fixation of negligence in causing the accident. With regard to the non-wearing of 'Helmet' and resultant death because of the head injury, it is only a 'consequence' after the accident. Because of the non-wearing of 'Helmet', the injury sustained to the head became fatal, leading to the death of the deceased”. The bench further added:- “It is true that, had the deceased been wearing a 'Helmet', probably his life could have been saved and the gravity of the injury would not have been this much severe, to have resulted in the death of the deceased. But the consequence because of the non-wearing of 'Helmet' was not the reason for knocking down the rider of the motor cycle by the driver of the jeep which was coming from the opposite side and this being the position, negligence cannot be fixed on the shoulders of the rider of the vehicle merely for not wearing the 'Helmet'”. Even though the court held that non wearing of helmet does not amount to contributory negligence, it sustained the award of the tribunal on other count. It was observed that since the deceased failed to maintain his correct side of driving, and accident had occurred due to the said fact, it was held that such an act amounted to contributory negligence from the part of the rider and hence the award of tribunal limiting the claim on contributory negligence was sustained but for a different reasoning. The court opined thus:- “At the time of accident the rider of the motor cycle had virtually crossed the middle line, whereas the jeep which was coming from the opposite side was maintaining the correct side of the road. We have perused the relevant records. It is revealed from the materials on record that the road is lying East-West. The motor cycle was proceeding from the West to the East and the jeep was coming from the opposite side. The road is having a total width of 6.04 metres and the accident was at a spot of 3.24 metres from the Northern end of the road; which means, the motor cycle had already crossed the middle line of the road. In other words, the rider of the motor cycle was not maintaining his correct side and as such, there is contribution on his part in causing the accident. 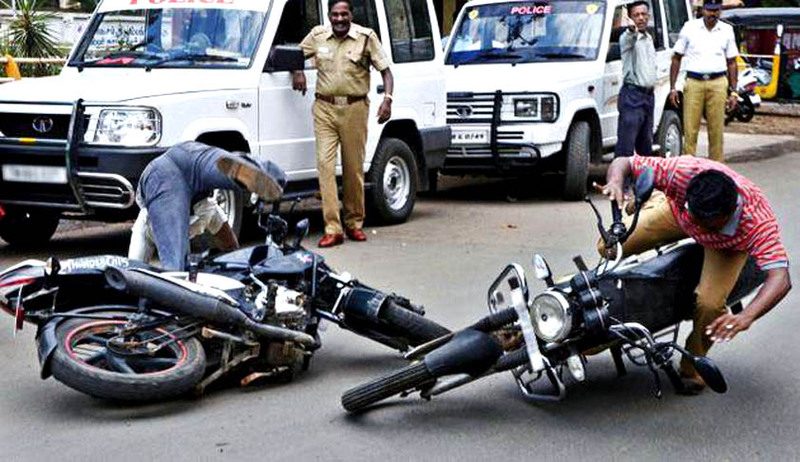 To put it more clear, the accident was not because of the non wearing of 'Helmet' but because of the negligence on the part of the rider in keeping his side as well, and in such circumstances, the fixation of negligence to an extent of 25% on the part of the rider of the motor cycle is not liable to be deprecated under any circumstance, though non-wearing of 'Helmet' may not have any relevance in causing the accident”.